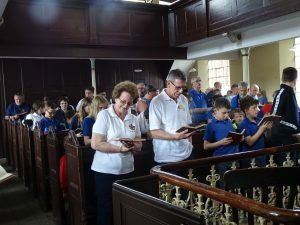 The Boys’ Brigade is a uniformed organisation for boys, and provides a balanced programme of activities for children and young people from 5 to 18 years of age. 1st Tamworth Company is based at Tamworth Baptist Church and plays an important part in the life of the fellowship. If you would like to know more about the company please contact the church office on 01827 283747 or email: office@tamworthbaptists.org.uk for more information. The Boys’ Brigade motto is: ‘Sure & Steadfast’ – taken from the Bible: Hebrews 6:19. For special events in 2017 please see this list. 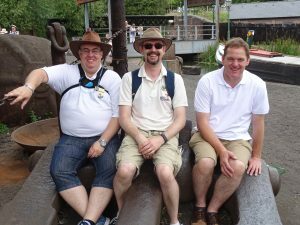 Visit to the Black Country Living Museum. This event by the Mid-Staffs & Sandwell Battalion of The Boy’s Brigade was to celebrate 100yrs (this year) since the Boy Reserves, subsequently becoming known as the Junior Section, was started. 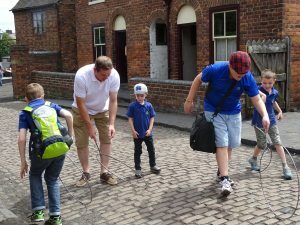 We took around 80 Juniors and their Leaders, together with a number of other lads totalling 120 members from 10 Companies, including our Boys and Leaders of the 1st Tamworth Company, for a day at the Museum. The day started with a Victorian School Lesson, where boys and Leaders had to sit up with arms folded and address the teacher as M’ame. One boy managed to be sent into the naughty corner for not being able to answer a question. The Boys had to recite the 2 and 3 times tables rhythmically, as well as use their slates and chalks for written work. 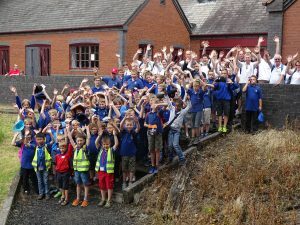 We then met up with all of the other Companies for lunch and a group photo, before going into the mine to learn about coal mining in the Black Country. There were some of our younger boys who were not to keen on the dark at this point and left the mine early. Our day concluded with a brief service in the Chapel which was led by our Battalion Chaplain and opened with a rousing rendition of our BB hymn ‘Will your Anchor Hold’. 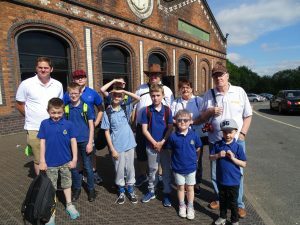 Finally everyone left having had a great day out with memories and experiences of what life would have been like for boys 100 years ago when the Junior section of the Boys’ Brigade was started.